You’ll want to tune in to Kelly McMillan’s Taking Stock Radio Show tomorrow, Friday, October 27, 2017. This week’s Episode 42 features respected action-maker and gunsmith Jim Borden of Borden Accuracy. The Radio Show, which streams on the internet, runs 8/27/2017 at 11:00 AM Pacific Time on VoiceAmerica Sports Channel. Jim and Kelly will discuss a variety of topics, including gunsmithing, action design/manufacture, the past/present/future of Benchrest and F-Class competition, and how Benchrest technology have influenced other disciplines. Jim Borden is a “benchrest icon” who has been in the business maybe as long as McMillan. Kelly notes: “I remember the Borden name dating way back to when it was just my mother, father, and I working in the garage. Jim Borden will share the story of his legacy with our listeners”. CLICK HERE to LISTEN. The Radio Show will also feature Kelly’s friend Kevin Finley, a professional bass fisherman. 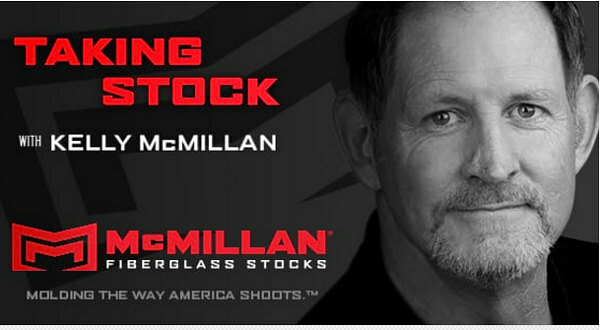 Access this and other “Taking Stock” episodes by clicking the Radio link on McMillanUSA.com, then select “Listen Live” or select Episode on Demand to hear previous shows. In past weeks, Taking Stock Radio has featured K02M and World F-TR Champ Derek Rodgers, Team USA F-TR Captain Ray Gross, Ballistics Guru Bryan Litz, Long-Range Champ Nancy Tompkins, High Power Champ Carl Bernosky, Legendary Olympic Shooter Lones Wigger, Sniper’s Hide Founder Frank Galli, and many other notables. It’s great to see two important businessmen give back to the shooting sports. Kelly McMillan and Jim Borden are working together on a project — creating an F-Class Open rifle that can be loaned out to young shooters to help them get started with the sport. Great idea — we need to get more young folks involved in precision shooting. In F-Class (as well as benchrest) we have an “aging population”. Engaging the next generation of shooters is vitally important. Jim and company began making Rimrock benchrest and Rimrock hunting actions in 2001. They added Borden Alpine and Timberline actions in 2006. These actions are made in an advanced manufacturing facility which has three CNC vertical Machining centers, three CNC lathes, three manual lathes, a manual knee mill, a surface grinder, a cylindrical grinder and wire EDM machine. To learn more, visit BordenRifles.com, call 570-965-2505, or send email to info [at] bordenrifles.com. Share the post "Jim Borden on Kelly McMillan’s “Taking Stock” Radio Show"